When your vehicle has been damaged by a collision or hail, you might be wondering where you should take it. Who can you trust? Who will provide the best price with service to match? Though many people recommend a dealership because they only work on vehicles like yours, most people have a local auto body shop that they prefer. Here are some reasons why you should choose a local shop over a dealership. Local shops often cost less than dealerships. Dealerships often charge a lot more to do the same type of work. Their hourly fee is more, plus they only use name-brand parts which also cost more. That being said, local shops are usually well equipped to deal with many types of issues. From minor scratches to paintless dent repair, most auto body shops can handle the minor and very major body work that your vehicle requires. They are often experts at restoring your vehicle to its pre-accident condition, so you don’t have to go to the dealership to get the attention and depth of experience that you need. 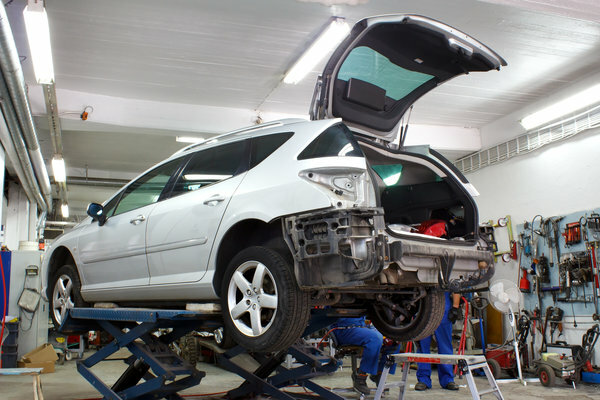 Dealerships often push for more repairs than are really needed. They have a checklist of items that they look at with every repair so they might try to convince you to change your tires or replace your brake pads, even though those issues don’t pertain to your collision damages. Local shops aren’t as pushy. Except for inspections, they aren’t going to give your vehicle a thorough look around just to see what else they can do for you and charge you with. While there are times when you are going to need to go to a dealership due to a complex vehicle specific issue, most of the time, you should be able to go to a local auto body shop and get fully taken care of without running to the dealership first. Not only will you save money, but you won’t get forced into repairs that you don’t really want or need to do! Contact us for all of your collision related needs!